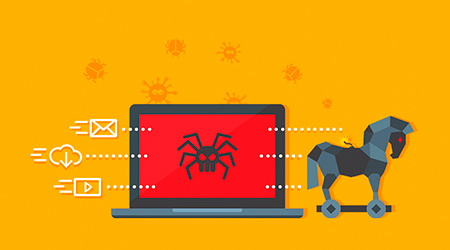 Home Endpoint Protection What is Trojan Virus? Trojans can't replicate themselves unlike other viruses. Exploit It contains data or code that abuses vulnerability within application software that’s operating on your endpoint. Backdoor It gives malicious users remote access over the infected computer. They can do whatever they want such as sending, receiving, launching and deleting files, displaying data and rebooting the endpoint. Rootkit These are designed to hide certain objects or activities in your system. This can effectively prevent malicious programs being detected. Trojan-Banker Its purpose is to steal your account data for online banking systems, e-payment systems and credit or debit cards. Trojan-DDoS Tis Trojan can start up the Denial of Service (DoS) attacks. Not only can it affect endpoints, but also websites. By sending multiple requests – from your computer and several other infected computers – the attack can overload the target address which leads to a denial of service. Trojan-Downloader Trojan-Downloaders can download and install new versions of malicious programs onto your computer – including Trojans and adware. Trojan-Dropper This is used to install Trojans and other viruses onto the computer. This can also conceal detection of malicious programs. If you're using a weak or outdated antivirus, some of them can't scan all of the components inside this type of Trojan. Trojan-FakeAV Trojan-FakeAV programs copy the activity of antivirus software. They are created to extort money from you. In return, they'll remove the detection and threat removal. Even though, the threats that they report are don't actually exist. Trojan-GameThief If you're into gaming, you know that online gaming can also garner loads of cash. Cyber criminals also crafted this Trojan virus which steals user account information from online gamers. Trojan-IM If you're fond of using instant messaging programs, this Trojan can take away your logins and passwords. Trojan-Ransom This Trojan can change data on your endpoint. This can lead to endpoint malfunction. The cyber criminal will demand a ransom. They'll only replace your computer’s performance or unblock your data, after you have paid them. Trojan-SMS It sends out text messages which uses mobile device to premium rate phone numbers. Trojan-Spy Trojan-Spy programs can spy on how you’re using your computer – for example, by tracking the data you enter via your keyboard, taking screen shots or getting a list of running applications. Trojan-Mailfinder This robs email addresses from your endpoint.